Bobcat has extended the company’s landscaping portfolio with the launch of a new range of self-levelling flail mower attachments for the company’s market-leading mini-excavators. 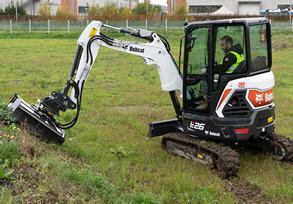 The first two models – the SL FM 60 and SL FM 85 - in the new flail mower range are compatible with the Bobcat E17 to E20 1.7-2.0 tonne and E26 to E35z 2.6-3.5 tonne mini-excavators, respectively. 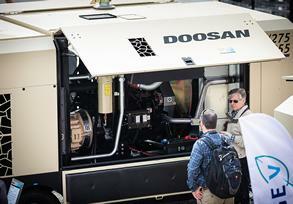 Doosan Portable Power (DPP) is showing several new portable compressor, generator and lighting products for the first time at Bauma 2019. They include the new Stage V compliant 12/205 and 12/255 portable compressors, the new 7/53R portable compressor for the rental industry, the new G20 generator and the new BL400 Balloon Light. Bobcat has launched the world’s first 1 tonne electric mini-excavator at Bauma 2019. 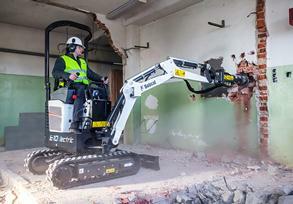 Combining zero emissions, low noise and a width of just 71 cm, Bobcat’s new E10e battery-powered, zero tail swing (ZTS) mini-excavator can easily pass through standard doors and in and out of lifts, making it ideal for indoor applications such as demolition and basement construction. 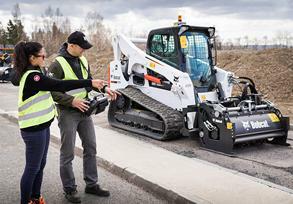 Bobcat is launching a new Remote Control System for Bobcat compact loaders. This system allows operators to leave their seat in the cab and control their Bobcat loader remotely. 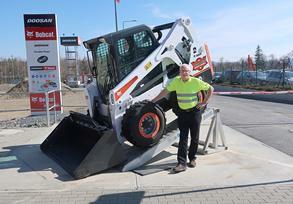 It is compatible with Bobcat skid-steer, compact track and all wheel steer loader models equipped with the company’s Selectable Joystick Controls. Bobcat management has nominated Robby Bosch, a Senior Field Product Trainer at the company, to be a Bauma Working Hero for the 2019 edition of Bauma, the world’s largest exhibition of construction machinery. 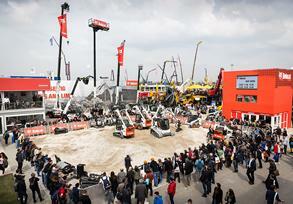 Robby is one of only three Working Heroes chosen for this year’s Bauma. 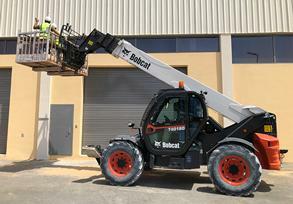 A leading Bobcat telehandler customer in Dubai in the United Arab Emirates (UAE), has praised the high performance, reliability and durability of the Bobcat telehandler range.